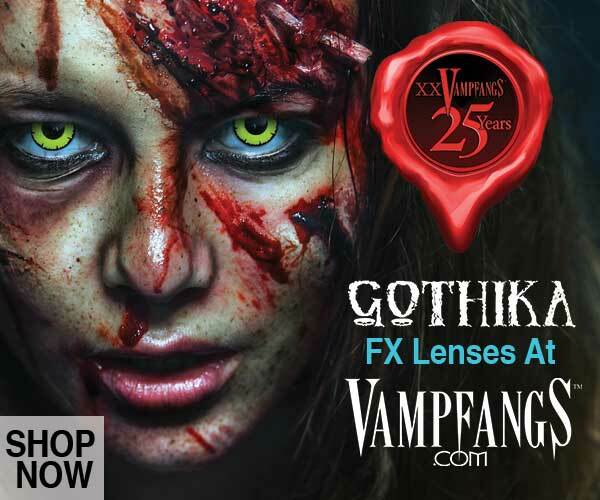 Haunted Chicago is loaded with history. 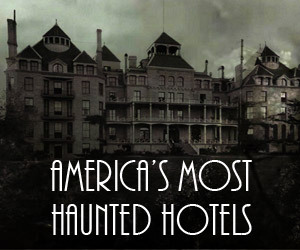 It’s also home to some great haunted establishments. 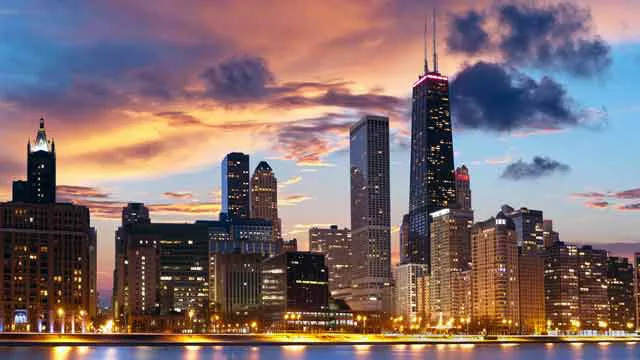 From churches and theaters to restaurants and hotels, this city is rich in paranormal activity going back to the Chicago fire of 1871 and beyond. So we couldn’t think of a better city to visit to try to catch some glimpses of ghosts. Besides, we love us some deep dish! Who is haunting the Congress? Legendary mob boss Al Capone is falsely rumored to have owned a suite on the 8th floor of the North Tower. Capone was not there, but his henchmen were and they followed out Capone’s dastardly orders. You can’t rule out Capone having made an appearance in the Congress though, as many people have witnessed a fat man wearing an old style suit roaming the halls. 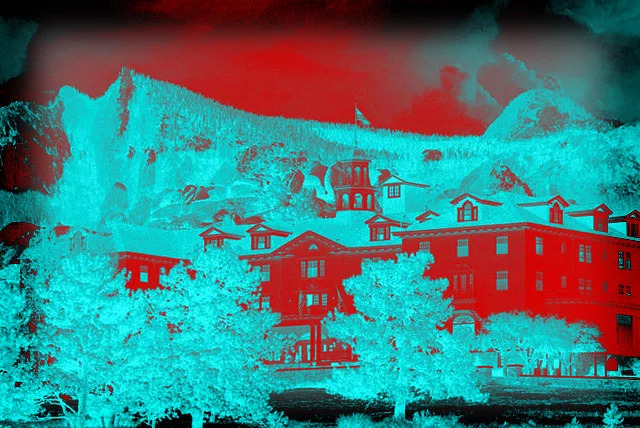 Capone ghost hunters might try the haunted Arlington Resort. The 12th floor is known to be haunted by the “Little Boy.” In the late 1930s, 6-year-old Karel Langer was thrown out the window by his mother who was worried about being deported back to Nazi Germany. Karel is known to follow people down the hallway to their room. As a result, many of the hotel employees refuse to work on this floor by themselves. In 1900, a Spanish American War Captain, Lou Astheim, shot himself in his room after waking to a horrible nightmare. People often report a shadowy figure lurking around the halls. 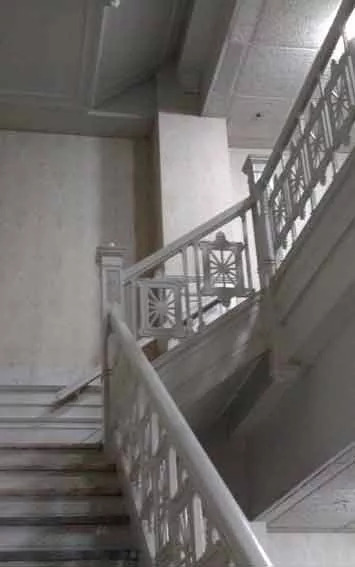 A security guard even reported chasing him up to the roof where he vanished. Several employees have seen a ghost hopping around the hotel on a peg leg. Some call him Peg Leg Johnny. Others believe it is Conway, the One-Legged Killer Clown who was arrested for murder just a few blocks away in 1912. Thirteen years later, he escaped from prison and was never seen again. Well, except at the Congress. The Florentine Room is a popular space for brides and grooms to dance the night away. But there are plenty of others who enjoy staying up late and making a ruckus. Guests who visit the room alone have reported hearing a female voice whisper in their ear. Others have seen chairs and tables moving by themselves. Maybe somebody doesn’t want the party to end? This is one spooky hotel. When walking the halls at night, you get the distinct feeling you are not alone. It may just be the old vintage feel of the place, or it could just be the ghosts. 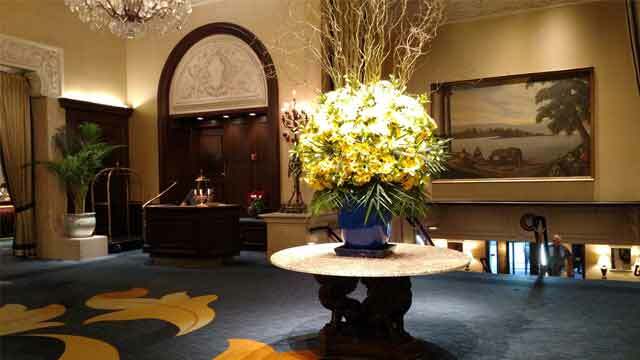 As soon as you walk into the lobby, the history of this grand hotel makes itself known. You can almost see presidents Grover Cleveland, William McKinley, Teddy Roosevelt, William Howard Taft, Woodrow Wilson, Warren Harding, Calvin Coolidge, and Franklin Roosevelt congregating there. 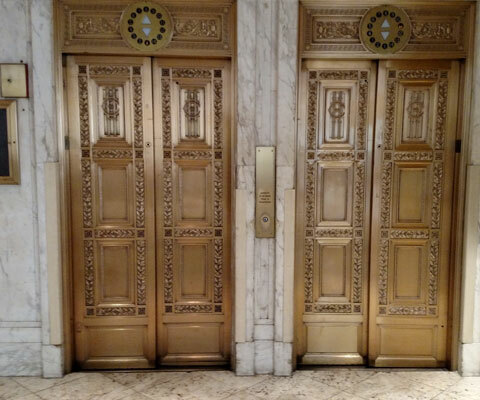 The Congress wins the award for coolest looking elevators. We would give it even more points if there was an attendant. 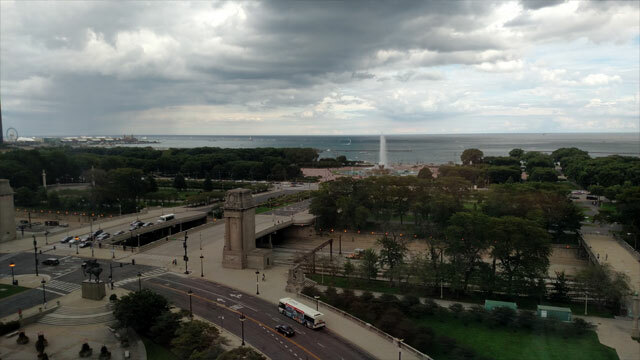 Once in our room, we couldn’t help but stop our ghost hunting for a moment and just enjoy our view of the lake. 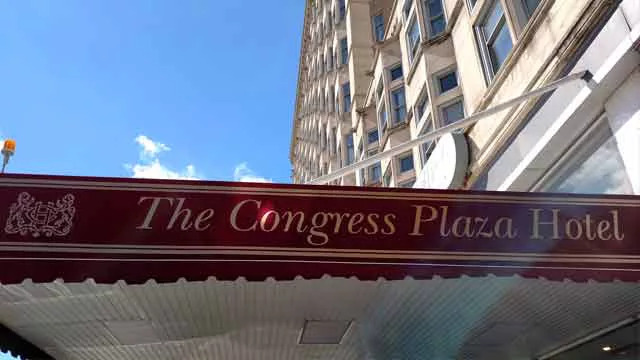 Overall, the Congress is a great hotel. It’s beautiful, in a great location, has a great staff, and is full of amazing Chicago history. 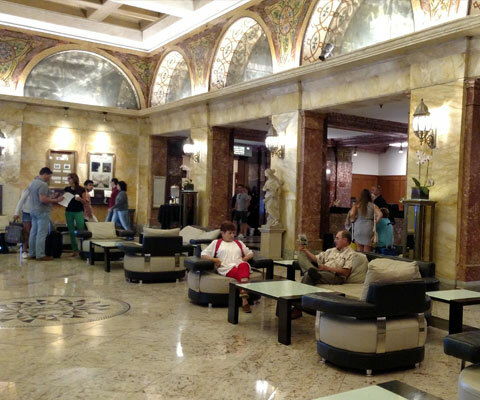 Ghost hunting or not, you can’t lose when staying at the Congress Plaza Hotel. 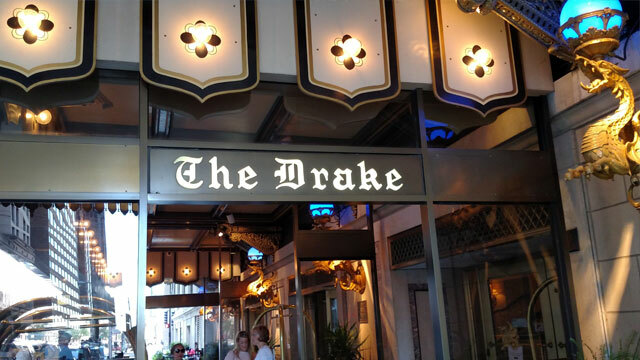 Who is haunting the Drake? Opened on New Year’s Eve 1920, the haunted Drake Hotel started off with a bang. Ghost stories have been floating around since day one. 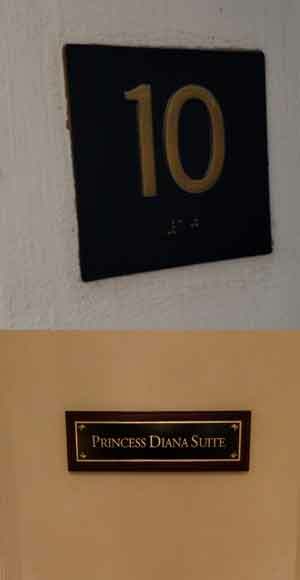 The 10th floor is where the “Woman in Red” lays her tired head. On New Year’s Eve, 1920, this poor soul caught her husband with another lady and proceeded to jump out of a 10th floor window. Some guests have seen her near 10th floor windows reenacting her demise. Some believe that this red dressed belle is actually Mrs. Adel Born Williams, a lady of high society who was murdered in the hotel in 1944. Her murderer was never brought to justice. The famous child-murdering duo, Leopold and Loeb, were interrogated at the Drake before heading off to the slammer. Although they did not die here, their victim’s father did, many years later. The Drake must be one of the most beautiful haunted hotels in the country, if not the world. We spoke to a couple of employees who have been there for several decades who said that they have seen the Woman in Red, but it had been many years. One very friendly security guard told us, “The day I see a ghost is the day I give my notice.” Scared much? We stayed on the 10th floor where all the action is reported to be. 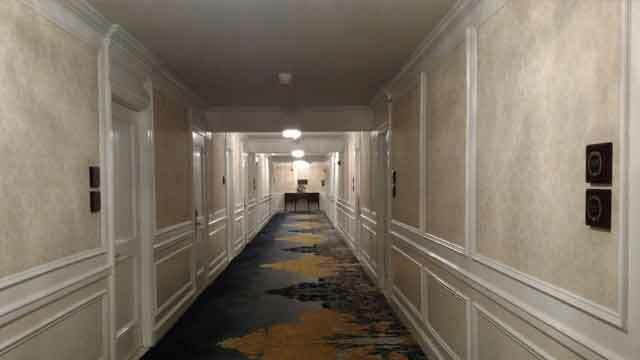 I don’t know what it is about old hotels that makes them so creepy, but walking down the hallway at night isn’t the most comforting experience. I know that lady in red was watching me. Even though the Woman in Red didn’t make an appearance, the Drake is now one of my favorite hotels. 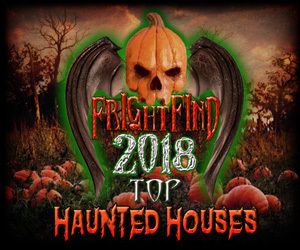 You can’t beat the location and the staff was more than happy to give us their opinion on the ghosts, which makes staying here for a spooky experience all the more fun.